Outreach workers say they found him on the ground, surrounded by a puddle of urine. The homeless man, a regular at The Lighthouse stabilization shelter, was located by workers driving the shelter’s outreach van, which patrols the streets and helps bring people in need back to the shelter. When the workers asked him what happened, the man told them someone had beaten him up and urinated on him. “He was very embarrassed about it. 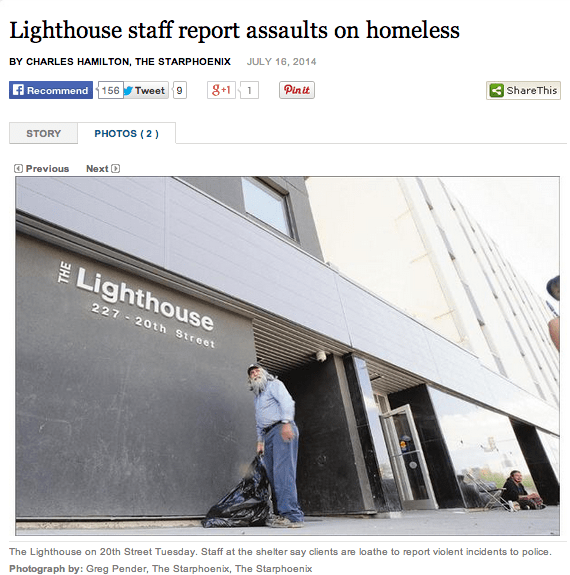 Our staff were very upset,” said DeeAnn Mercier, a spokesperson for the Lighthouse Supported Living. Mercier said the apparently unprovoked attack on a homeless man last Tuesday is a just one of several cases staff at the shelter have encountered this year. The man would not consent to an interview, and staff would not give his name. City police say they have not seen any increase in reports of violence against homeless or marginalized people. The urination incident last week was not reported, Insp. Mitch Yuzdepski said Tuesday. “Definitely if something is happening to our homeless population, we want to know about it,” he said. Yuzdepski said a homeless person was the victim of an aggravated assault on June 28. The man was found on the 300 block of Avenue F South. He was badly beaten and police are still searching for suspects. Yuzdepski said that one reported case is no cause for alarm. Mercier said Lighthouse staff have been talking to police about the increased violence they are seeing. She said homeless or disadvantaged people aren’t always comfortable reporting to police. “It’s especially heartbreaking when they themselves don’t have the courage to complain to anybody or to talk to police because they don’t think their complaints will matter,” Mercier said. Yuzdepski said patrol officers are talking to people at the Lighthouse and trying to learn more about the alleged assaults.